Joy Creek Photo Archive (c) all rights reserved Star jasmines are popular as evergreen climbers and also for the fragrance of their white flowers. 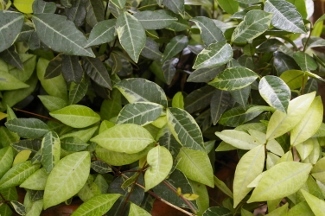 Trachelospermum jasminoides 'Variegata' offers a variation on that theme with the same glossy, leathery leaves that are veined and marked in white. Sometimes whole leaves will appear entirely pale. We have found this plant to be slower to flower than the green-leafed form. This looks lovely spilling out of large containers, draping off of deck and porch railings, or vining up trellises in lightly shaded areas.